The Walking Dead: Michonne – Episode 3: ‘What We Deserve’ will be available starting Tuesday, April 26. If you’re looking for more shambling corpses, here’s our list of PC’s best zombie games. 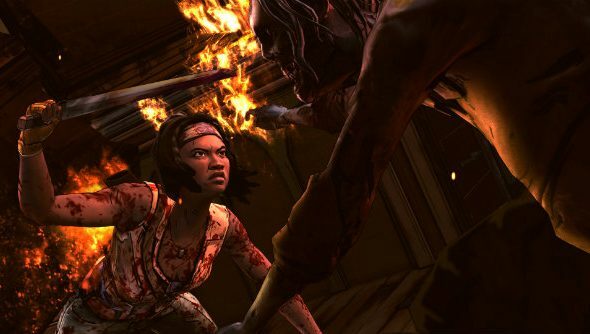 In this final episode of Telltale’s Michonne-centric miniseries, everyone’s favourite katana-wielding heroine will try to protect an innocent family as the weight of her past begins to take its toll. As always, your choices will determine how everything plays out: who lives and who dies; whether a zombie gets a hammer in the head or kicked down the stairs; and if Michonne can be arsed to even speak or not. If you missed out on the opening episode, our spoiler-free The Walking Dead: Michonne PC review should give you an idea of what to expect from the miniseries.